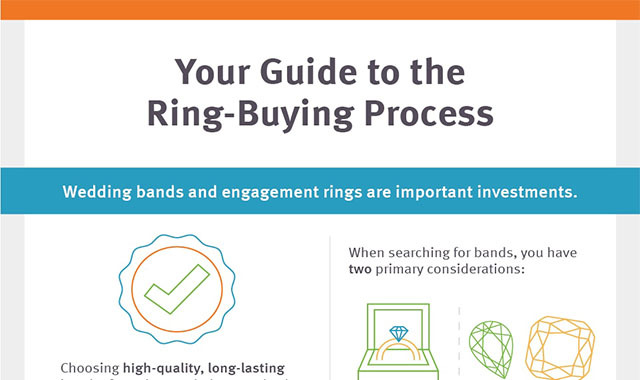 With This Ring: Your Guide to the Ring-Buying Process #infographic ~ Visualistan '+g+"
Regardless of how a couple gets engaged or the size of their wedding, they’re likely going to want rings. Buying rings can be overwhelming thanks to the wide variety of options available, so you may want to start with the basics: materials and gemstones. The traditional metals most jewelers offer include platinum, cobalt and titanium, but do your homework to learn which works best with your lifestyle and needs. For couples who want a more unique ring, options such as meteorite, stainless Damascus steel (derived from ancient sword-making practices) and even wood are all potential options.